‘Journey to the Shore’ won director Kiyoshi Kurosawa the Un Certain Regard prize at last year’s Cannes Film Festival. It is also the Masters of Cinema label’s latest foray into the new release market; the label is more frequently associated with the restoration of forgotten classic cinematic releases but has enjoyed success with the likes of ‘Listen Up Philip‘ and ‘Life of Riley‘ in recent years. 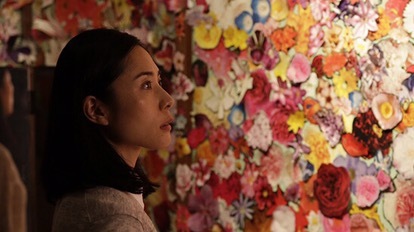 The film tells the story of Mizuki, a young female piano teacher mourning the death of her husband Yusuke, who we learn has drowned at see three years prior to the start of the film. However, when his ghost appears mysteriously at home one day, she is less surprised at his presence and more annoyed as he has forgotten to take his shoes off. The reunited couple set off on a journey together as he takes her to visit the people who have helped him journey home from his point of death, with Mizuki’s resulting spiritually cathartic journey being the focal point of the story. It’s a story that is rooted in Japanese culture, with the human grieving process following the death of a loved one a typical starting point for its fair share of Japanese films in recent years. Where this sets itself apart is in the very blatant separation from reality afforded by the seamless interaction between the living and the dead. There doesn’t seem to be any hard and fast rule about who can talk to whom, nor does there seem to be any surprise or shock experienced by the living seeing a close departed friend or family member. Indeed, Yusuke is portrayed as a living, breathing being with he ability to fully interact with his surroundings. It’s a unique spin on the matter (pun intended). There are some really effective cinematographic techniques employed to reflect the mood of the scenes, most notably in the dimming of the lights when a darker story is being retold. The credit here lies with director Kurosawa and his cinematographer Akiko Ashizawa. It was subtle enough to have an impact before I realised what had happened, as key characters revealed their darkest of memories, and it added considerably to the picture. Whether it really works as a whole is something I’m still not totally sure about. Certainly it is delivered with conviction, though the overall effect is something entirely morose. There seemed to be a relentlessness to the depression involved that, whilst perhaps reflective of the mood of the characters involved, seemed to offer nothing in the way of a positive escape for anyone watching looking to be guided by the grieving process. The film achieves its aims and carries everything off to perfection. It’s just not a very pleasant experience to sit through. Much more understated in its promotional campaign than its awards season rivals – and a much harder film to describe with any vigor and make it sound interesting – Room is a film that simply needs to be seen. It may not seem it but it’s a wonderful hidden gem, the quality of which will only become apparent once you’ve seen it. It is a film set in two distinct acts. The first act is based entirely in the room in which a woman known as Joy (Brie Larson) and her five-year-old son Jack (Jacob Tremblay) have been held captive by the mysterious Old Nick (Sean Bridgers). Following their release, they are reunited with Joy’s family and the outside world – a world that has left Ma behind and that Jack has never even experienced. Overwhelmed by their new freedom and affected by their psychological damage, we follow Joy and Jack as they try to find any kind of normality in their new life. Jacob Tremblay and Brie Larson in Room. The tiny room is suffocating in its lack of space and the feeling of being trapped is never more convincingly portrayed than when Jack is hiding in his cupboard. Looking primarily from his point of view in this first act, the room comparatively seems quite large – to him it is the whole world as he knows nothing else. Through the unavoidable depressing nature of the situation, there are moments included that are truly uplifting. Seeing Jack finally open up to a family member is a beautiful moment. Indeed, it is surprising that Jacob Tremblay hasn’t been singled out for his stunning performance as Jack, a child who has gone through an impossible first five years of life. He has either been coached really well or is a true natural. That said, Brie Larson can rightfully take the praise for her leading performance. Her character has taken the journey from childhood to motherhood within the confines of one small room and has remained strong for the sake of her child. The emotional turmoil is all there to be seen. It is deliberately difficult but equally rewarding to witness. An early contender for one of my top films of the year. Room is on general release globally now. If you loved the Pixar animated feature film Inside Out then chances are you’ll… like “Riley’s First Date?”, the short included as a bonus feature on the various Blu-ray versions of the release. It centres around a mysterious boy showing up at Riley’s household to take Riley out, with most of the jokes coming from the parents’ reactions to interacting with him. If you’ve seen Inside Out itself, it is essentially an extension of the final sequences of the film, popping in and out of the characters’ heads in rapid succession for quick laughs. It lacks any of the emotional pull that made the film a huge success over the summer, but it does succeed in getting a few jokes that make it worth a watch. It can’t go down as a reason to purchase the Blu-ray – you don’t need any more reasons than the fact it’s the best Pixar films released for years. After a relatively long break, Steven Spielberg is back behind the director’s chair, and it was worth the wait. Reading the description of Bridge of Spies, his first film since the hugely successful biopic Lincoln, it has all the hallmarks of some of his greatest achievements in cinema. It’s based on a true story. It’s a story about individual battles within a larger situation. It stars Tom Hanks. It would have been a surprise if this wasn’t a huge success. Set between 1957 and 1960 during the height of the Cold War, the film focuses on James B. Donovan (Hanks), a lawyer tasked with negotiating the release of Francis Gary Powers (Austin Stowell), a pilot whose U-2 spy plane has been shot down over the Soviet Union. The negotiation concerns trading Powers for Rudolf Abel (Mark Rylance), a Soviet KGB spy held captive in the USA who Donovan has previously defended in court. However, tensions rise when Donovan shows his determination to include an additional US citizen – student Frederic Pryor (Will Rogers) – in a move that seemingly only he is keen to see through. This is an ode to traditional storytelling and any movements it makes to remind us of Spielberg’s supreme talents are trumped by its underlining of Tom Hanks as one of the greatest living actors. This is not a story about espionage, politics or the Cold War. It is a film about one man’s unwavering desire to stick to his principles. Hanks portrays Donovan as a totally unassuming man whose aggression is only touched on when he feels the principles for which he stands are threatened. As with most of his best roles, it has a way of pulling you in and asking you what you would do in his shoes. If it is considered for any awards in the next few months, it will be for Hanks as an actor in a leading role. For all the clever cinematography and attentive set design, they are merely the stage on which Hanks is allowed to fly. Bridge of Spies is release in cinemas worldwide on 27th November 2015. I’m well aware that this sounds condescending. It is fueled directly by the woman in front of me who three times during the film decided to have a quick check of her phone next to her pocket. Whilst it was only a minor distraction for me (it wasn’t so bad to warrant me tapping her on the shoulder), she missed two critical plot points and the description of what the characters did next in the final credits. Definitely a justification for the theory that the audience’s participation level is as important as the care put into a film. ORION: The Man Who Would Be King (12A), the latest feature documentary from award-winning director Jeanie Finlay (Glimmer Films) is released into UK cinemas from Friday 25 September and has received distribution support to enhance this theatrical release from Creative England and Ffilm Cymru Wales. Orion tells the story of Jimmy Ellis, an American singer with a natural voice that drew unavoidable similarities to Elvis Presley. 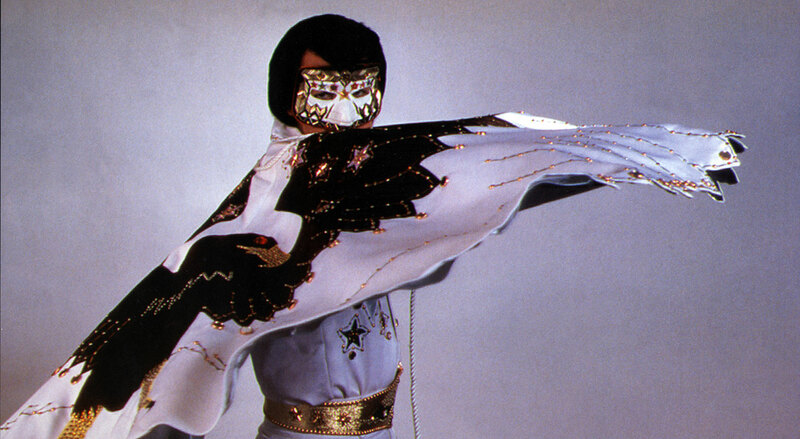 In the aftermath of Elvis’s death in 1977, music producer Shelby Singleton of Sun Records played on the conspiracy theories about Elvis having faked his own death and created Orion – a masked singer with a mysterious past who had the look and sound of Elvis whilst never laying claim to being the man himself. For four years success lay in the hands of Ellis as he toured and rode the waves of popularity, but frustrations crept in about the public perception of him and the deals he had signed and he finally broke away from his deal in some style. This documentary was spawned by a chance purchase at a Nottingham market, where director Jeanie Finlay picked up a copy of the Reborn album on 12″ vinyl, Orion’s debut release. That was where the interest in him started, and between then and now the director has visited almost everyone closely involved in his life to discuss their experience of a man driven by a desire to sing on his own terms. It is excellently put together. It is a story that threatens to be either not very interesting or flawed due to lack of decent source material (the Presley estate provide little footage for these kinds of films and many of the key people in the film were unavailable for interview). Fortunately, neither of these things threaten to creep in and the end product is fascinating. It goes a long way into intimately portraying a man torn between being forced to hide behind a mask and enjoying the limited success he was achieving. It is balanced and as such avoids over-celebrating Ellis, concentrating on his personality rather than his success. As with most music documentaries, many of the anecdotes bring huge amounts of comedy to the table and Finlay has been careful to interview as many people as were available, no easy task when on such a tight budget. Orion: The Man Who Would Be King is a documentary worth watching, and it’s an experience enhanced if you know nothing about Ellis. A full list of screenings can be found on the official website. Keith Richards: Under The Influence is a documentary film by Morgan Neville, the man responsible for the excellent Academy Award-winning 20 Feet From Stardom. Richards has a new album out – Crosseyed Heart – and the timing of this film gives it the feel of being a bit of an extended promotional interview. Indeed, that’s exactly what it is. Bringing in a few musical friends to offer further insight, the film is actually a series of interview filmed in various locations across the USA. The fact it is just a talking heads film is not to say this is a disappointment as a documentary. Fans of the band and/or the individual will find a lot of joy from watching the series of interviews with a man who knows how to tell a tale. Most avid fans have probably already read his autobiography “Life” and an 80 minute film is never going to cover the depths of a 500-page book. Keith Richards: Under The Influence is available excusively on Netflix now. American Ultra is far better than it should have been. The basic story – a stoner grocery store assistant (Jesse Eisenberg) is actually an advanced agent from a secret programme that was shut down before his memory was wiped – sounds like pretty standard fare and doesn’t really suggest a great film is in order. A fast pace, short running time and well-judged performances make it an enjoyable romp. Eisenberg is well cast and it’s a wise move to keep him in reluctant stoner character throughout, though it would have been easier to make him magically turn into an alpha male. Kristen Stewart makes another case for the ATL (Anti Twilight League) to take her a little more seriously with a solid performance and there are great turns elsewhere from Bill “Was That Bill Pullman?” Pullman, Topher “That 70s Guy” Grace, John “Luigi Mario” Leguizamo and Tony “Loose Seal” Hale.Perhaps this film doesn’t justify a trip to the cinema, but when it hits the steaming platforms it should be near the top of your list. American Ultra is out now at cinemas in the UK.